Looking for a simple yet delicious recipe to surprise your flatmates? 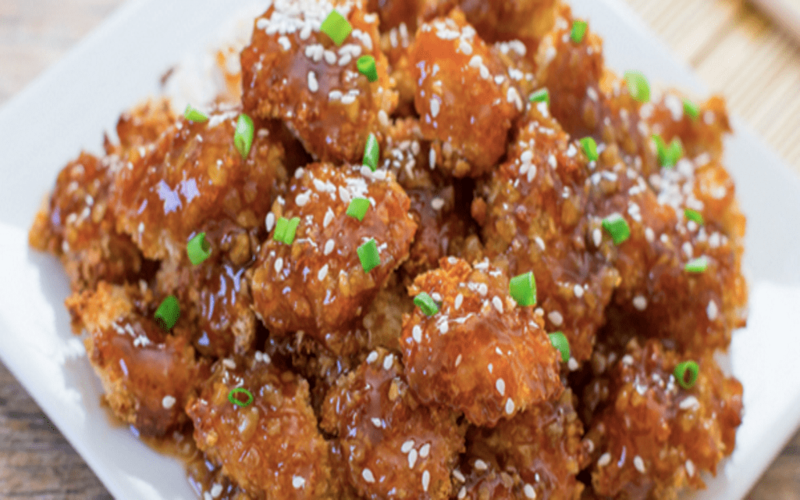 Get your chef hats on, we have the perfect recipe for your weekend cooking- Garlic Honey Chicken Dry. You can enjoy it as a starter, appetizer, or even main course, and works amazing if you are looking to cook something up on a budget, as the ingredients are not very many, and can be found either in your kitchen or your local grocery store. Garlic Honey Chicken Dry is a staple of oriental cuisine and can be “Indianized” to suit our taste buds too! It is best served over a bed of plain or flavoured rice, noodles, pita or can be served with ketchup or a tasty dip and can be eaten as is. Follow this recipe, and trust me, it will taste better than takeout. Give rest to your food delivery apps now! Make Garlic Honey Chicken Dry, and enjoy it at any time during the day! For garnish: sesame seeds, coriander. Note that any part of chicken including the legs, breast or thighs can be used for this recipe, but chicken thighs provide you with the most tasty and most crispy results. You can chop them into whichever size you like, and adjust the cooking time accordingly. You can find the aforementioned ingredients easily in your kitchens. In case you don’t have any, pick them up from your nearest grocery store, or you can order them online from Big basket or other grocery store near you. In a big bowl, season the chicken pieces with garlic powder, salt and pepper to taste, and put it aside. Heat a skillet over medium and add some oil in it to grease the pan. Now add the chicken pieces and cook then over medium heat for about 4 to 5 minutes on each side, until they are cooked properly. For the sauce, in a bowl, mix together garlic, soy sauce, honey, vinegar and chicken broth. Once the chicken is cooked, add this sauce in the pan, and cook it till the sauce is reduced and has fully seeped in the chicken pieces. Once done, get it off the flame and garnish it with some sesame seeds and coriander and serve over rice or as is. You can also watch this video for better understanding of recipe. Such few ingredients are required for such an amazing, lip smacking, delicious dish! And it is super easy to prepare too. The sweetness from the honey, the saltiness from the soy sauce and the sour punch from lemon makes a perfect combination of a party in your mouth! Garlic Honey Chicken Dry makes for a super simple yet sophisticated dish to be served as a starter at house parties, or you can thicken and add more sauce and serve it as a main course alongside some rice or noodles. I bet your mouths are salivating right now! You want to enjoy the dish, but don’t have the time to prepare it? Don’t worry, we have that covered for you too! Head on to your favourite restaurant, or order Garlic Honey Chicken Dry online from Swiggy, Foodpanda, or Zomato, and get it delivered at your doorstep. While you’re ordering, don’t forget to use Swiggy coupon code to avail discounts like Rs.100/- off on first order, 10% cashback via Freecharge, etc. Enjoy this lip smacking delicacy today!